This is a re-read for me, but I'm struggling to find books on my shelf for the Aussie Author Challenge. 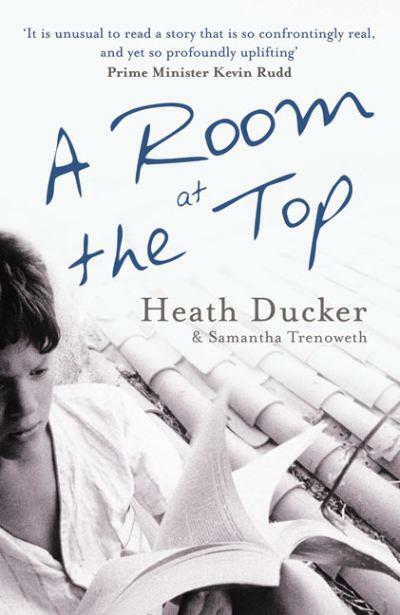 I first read this book in 2010, after seeing Heath Ducker speak at a breakfast seminar at the National Family Law Conference in Canberra. Heath didn't bring any of his books with him, so I went out and bought the book at lunch time. I was lucky enough to see him in a lecture later that afternoon, though I hadn't expected he would attend any of the lectures, since he's not a family lawyer. So, I think I embarrassed him, by running up to him and asking him to sign the book. I don't care - whatever it takes! Heath was a good speaker, for a young man. He was engaging and honest. Inspired by his speech, I read his book really quickly, the first time. It left me feeling like I was ignited with compassionate energy to do something for those less fortunate. I contacted Youth Insearch, which had helped Heath so much in his life, and got a very ambivalent response. It wasn't encouraging. I got the pattern to knit the love wraps, and did a few of those. Then I moved to Sydney and got caught up with the craziness of just trying to survive in this fast-paced city. The book flows really well. It follows Heath through his early years, through his battles, and then through his achievements as a young man. He grew up in 'abject poverty, in a dilapidated government house with shattered windows and holes in the floor through which weeds climbed. He lived with his single mother and nine siblings, conceived with many different fathers. Most days they had nothing to eat but breakfast cereal. Just when it seemed things wouldn't get worse, Heath was sexually abused by the father of his closest friend.' He ended up as a young lawyer at a top-tier law firm in Sydney, though I think he now works in a government department. As I said, I raced through it when I read it first. On the second read, I took my time. I knew where it was going, so I reflected on the messages a bit more. I also don't think that the book conveys Heath's real voice. It uses some fairly emotive language, and I think it is written with some deep insight and reflection that may not have been possible without some heavy editing. I do think it's the best book Australian true story, after Kinglake-350, that I have read. This time, rather than leaving me with an intense desire to do something straight away, I have been more reflective myself. A lot of what Heath believes in - in a supportive community, and committed individuals providing special services - I don't think I can achieve whilst living in Sydney. I have no sense of community at all, here. That's part of the reason why my husband and I have decided to move back to the country in the coming months. Working in a small firm, actually doing grass-roots law, I will be helping individuals with real problems. Currently, I have no effect on anyone's lives whatsoever. I am not practicing the kind of law that I want, at the moment. I will be returning to doing family law, to representing children in child protection matters, to representing criminals in petty crimes, and representing families on the death of their loved ones. I can't wait. I will be a member of a small community, and I will participate and aim to make the community a better place. I hope that I will eventually participate in the Aunties and Uncles program that Heath found so useful, but if not, I may be able to do some short-term foster care or respite care for needy kids. Everyone should read this, if you have any concern for the decline of community and society.